Brightwing is a strong Support Hero because of her mobility on the battlefield and her ability to Polymorph opponents. Considering she can teleport, heal and apply shields, she's a (cute) monster to fight against. At the moment she's considered one of the better support Heroes in the game thanks to her versatility and flexibility. What I will add is that as Heroes of the Storm maps continue to grow in size, her teleport becomes more and more valuable. With success on many Battlegrounds also hinging on outlasting your enemy, this quick travel makes Brightwing a useful pick. The only weakness to Brightwing, certainly in the current meta, is the fact she lacks burst healing and is prevenative - rather than reactive. That absolutely can work, especially if you've a high damage team, and if you can begin to snowball with Brightwing and reach her late game Talents, she can work exceptionally well. Soothing Mist (Trait) - Passively healing your allies can be very helpful during team fights, but also helps Brightwing lane quite effectively thanks to the constant sustain. This also allows you to choose to bully your opponent if you want to go for that play style, as you can simply heal up after trades. One thing to be aware of is that Soothing Mist only triggers if there is an injured ally within its range. If not, it will activate as soon as there is an injured target in range. What's now particularly powerful about Soothing Mist is that it also removes crowd control in an instant, to all those affected. Just be aware that it doesn't make your allied Heroes Unstoppable. Phase Shift (Z) - Brightwing does not have a mount, but does gain the ability to teleport to an allied Hero every 45 seconds. This does have a 2 second channel, during which time you can be interrupted, putting phase shift on a 10 second cooldown. This ability means that Brightwing can support an allied Hero anywhere on the map, which also makes her an effective split-pusher. Keep on eye on that cooldown, however, as you usually don't want to be split-pushing when Phase Shift isn't available. Arcane Flare (Q) - The slow travel time of the projectile means that you have to be able to predict your enemy's movement well if they're not already locked down. With that said, the range is fairly long; so much so that you can hit towers and forts without them being able to fire back at you. This is particularly helpful when you do decide to split-push, as you can safely attack buildings even without minions. Polymorph (W) - One of Brightwing's signature abilities, this is an extremely effective form of CC. Stopping the other team's Assassin from being able to deal any damage for a full two seconds can flat-out win a team fight. You can also use the ability to interrupt an important channel, or enable your team to focus down a Warrior if need be. A movement speed reduction on top of this means your target simply becomes a sitting duck. Pixie Dust (E) - This is an extremely useful defensive ability that can easily save an ally's life. The movement speed boost might be enough to get them out of harm's way, but being able to mitigate 25% of all incoming spell damage for 3 seconds is huge. For a frontline hero, or a high value ally that's under threat (especially from heroes such as Li Ming, Kael'thas or Gul'dan), the mitigation Pixie Dust provides - right from the get-go - is amazing. Blink Heal (R) - Being able to re-position yourself while also healing your ally makes Blink Heal a versatile and strong ability. A low cooldown means you can use it often, though you do need to be careful about who you're targeting. Going to heal your Warrior during a team fight means you could be putting yourself in the front line, becoming an easy kill. It's often better to heal up your ranged assassins, especially considering that the heal amount is not huge, though it is available often. Emerald Wind (R) - Pushing enemies away can have two benefits: First, it can immediately disengage a fight when your team isn't ready. Secondly, it can be used offensively to single out a target and push them into your team. The fact Emerald Wind boosts healing mists by 5% for all those around Brightwing is a considerable boost to her healing. It's without doubt her strongest ability right now and a must-have talent. Hyper Shift reduces Phase Shift's cooldown by 2 seconds every time a nearby minion dies. Not only that, but it also increase Phase Shift's healing by 10% of your target's maximum health, allowing you to output much higher healing on arrival. Unstable Anomaly increases the slow on Polymorph by 15% and on expiration, causes it to deal damage to those around it worth 2% of their maximum health. Great for softening up targets. Vision is often key, so taking Peekaboo! to reveal a massive area after Phase Shift is often a life-saver. Best of all, it also allows Brightwing to deliver a high level shield to the recipient, ensuring their survival in a pinch. Considering Brightwing has limited AOE healing, Blink Heal allows her to target a team-mate and directly boost their health instantly. For saving someone who's low health, it's a must. Variable: Emerald Wind offers high damage and a means of protecting your team by knocking enemies back. In a pinch, it can steal a boss, peel for your team, and trap enemies in tight spaces for your team to burst down. Safety Dust elongates the duration of Pixie Dust by 1 second and allows Brightwing to heal anyone affected by it for 25% more. Considering most players you use Pixie Dust on are under pressure, the additional healing comes in handy. Critterize increases the damage players receive when Polymorphed by 25%, allowing Brightwing and her team to comfortably blow up an enemy quickly. Variable: Phase Out allows Brightwing to make herself invulnerable for a short period of time. While she can't move during it, it does ensure she can survive or mitigate massive incoming damage, while also buying her time to regain her cooldowns or have her team come to her rescue. 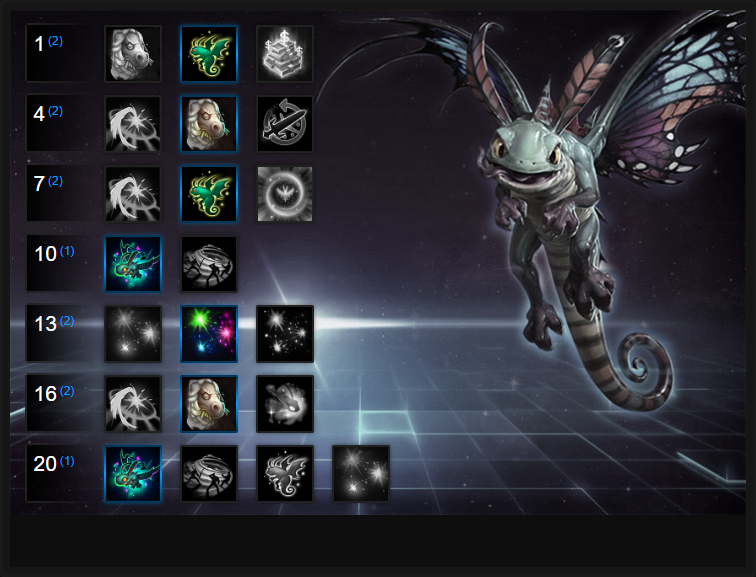 Invisible Friends allows Brightwing to stealth herself and an ally when using Blink Heal. Considering she puts herself in harms way when blinking onto the front-line, it's amazing for reducing risk and allowing her team to disengage. All Heroes stealthed by her also receive healing over time and are unrevealable. This list of tips and tricks are just a handful of things we think will help your Brightwing play. We'll continue to add to the list as required and if you have any tips you'd like to share, let us know in the comments below and we'll place them here. 1. Always try to use your Teleport after you've gone back to base to restore your mana. This will quickly allow you to travel back into battle. 2. You should be supporting your allies all across the battlefield, so don't be afraid to constantly teleport to top, middle or bottom lane when they need help. 3. Try to stay in lane for a long enough to pressure the opposition with Polymorph and your partner. They'll quickly retreat behind their walls. 4. Use Blink Heal for most heavy damage situtations. You should however be using Pixie Dust first, rather than over-healing. 5. Brightwing can be mana intensive early game if you use your skills too much. Remember to only use your skills when neccesary: let others do the damage. 7. Polymorph is incredibly powerful - ensure you use it against enemy support or assassins to prevent their healing/spike. It's even more powerful against the likes of ETC when he's using his elite. 8. Storm Shield has a lengthy cooldown of 45 seconds. You should only be using it when your team is about to take large amounts of damage, be sure to follow this up with Gust Of Healing and a double Blink Heal for maximum defense. 9. With Phase Shift providing a significant shield to an ally, be sure to use it just before a team fight as its shield lasts 20 seconds! 10. Remember you're a healer. You shouldn't be in the thick of a fight, but on the edges of your team (but close enough to still heal and buff them).